Marcel Granier also vowed to fight against the president's plans in Venezuela's courts and on the international stage. The BBC's Greg Morsbach in Caracas says Mr Chavez has repeatedly threatened to take the TV off the air but has never given a date. The move could help silence some of his critics in the media who have been a thorn in his side for several years, he says. Mr Chavez, who was returned to power by a wide margin on 3 December, said Mr Granier was mistaken in believing "that concession is eternal". "It runs out in March. So it's better that you go and prepare your suitcase and look around for what you're going to do in March," he said during a televised speech to soldiers at a military academy in Caracas. "There will be no new operating licence for this coupist TV channel called RCTV. The operating licence is over... So go and turn off the equipment," Mr Chavez said. 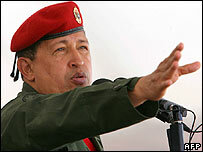 Mr Chavez said the channel was "at the service of coups against the people, against the nation, against national independence, against the dignity of the republic". The channel is among a number of private TV and radio networks that in recent years have strongly criticized Mr Chavez' government and favoured the opposition. Many media outlets, including RCTV, supported a bungled coup in 2002 and a devastating general strike in 2003 that failed to unseat the president. The press freedom campaign group, Reporters Without Borders, said the proposed move would be a grave violation of freedom of expression in Venezuela. RCTV is one of the country's oldest channels and began broadcasting in 1953.